This is an enjoyable sequel with impressive animation and lively fight sequences but it's neither as funny nor as emotionally engaging as the first film and it largely side-lines its previously fabulous supporting cast. Directed by Jennifer Yuh Nelson, Kung Fu Panda 2 is the sequel to the 2008 animated hit. Dragon Warrior panda Po (Jack Black) is now the sixth member of the Furious Five Kung Fu team – including Tigress (Angelina Jolie), Monkey (Jackie Chan), Crane (David Cross), Viper (Lucy Liu) and Mantis (Seth Rogen) – but has yet to master inner peace, thanks to some haunting, dimly remembered images from his childhood. 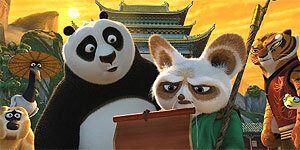 However, before Master Shifu (Dustin Hoffman) can help Po uncover his past, the valley is threatened by evil peacock Lord Shen (Gary Oldman), who is developing a super-weapon with which he plans to conquer China. Po and the Furious Five duly spring into action against Shen's hordes of hulking wolf soldiers, but Shen's soothsayer (Michelle Yeoh) has long warned that he'll be beaten by a panda, so he's prepared for a fight. The animation is gorgeous throughout, particularly during the beautifully designed flashback sequences. The fight scenes are nicely handled too, with obvious thought having gone into the kung fu styles of the Furious Five and how they would combine to fight as a team; the only downside of this is that the fights happen so quickly that you want to slow the film down and appreciate them properly. Black is on fine form as cuddly fighting machine Po and Gary Oldman is inspired casting as his villainous peacock nemesis. However, the fabulous supporting cast is rather side-lined this time, with only Jolie's Tigress getting much of a look-in and Chan, Liu, Rogen, Cross and Hoffman hardly having any lines at all. The main problem is that since Po is now a kung fu super-warrior instead of a bumbling, over-eating fat panda, the script doesn't have nearly as much comic potential, so there are significantly less laughs this time round – it even ruins one of the best jokes of the first film (James Hong as Po's unexplained duck father) by addressing the issue of Po's parentage. Similarly, the film doesn't quite pack the same emotional punch as the first movie, although there is a great ending that hints at interesting developments in that direction for Kung Fu Panda 3. Kung Fu Panda 2 is an enjoyable sequel that won't disappoint fans of the first film, though it doesn't quite hit the emotional or comedic heights of its predecessor.